We love our lakes in Reston, and we love the being near all of the amenities Reston has to offer. The Lake Newport area of North Reston delivers both — whether you want a contemporary or Colonial single family home, or a spacious patio home, or even condos. 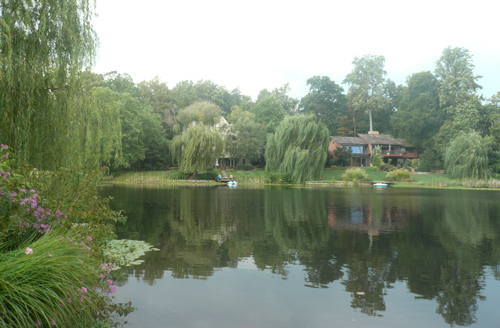 Whatever style of home you want, your neighborhood focal point is Lake Newport, a 12-acre man-made lake built in 1981. On any beautiful day, you'll find residents canoeing and fishing in the lake, or using the approximately 1-mile walking path that loops the lake and takes you on a tour of the neighborhood. Lake Newport Road: This neighborhood is located at the eastern end of Lake Newport Road off North Village Road. Many of the 15 lovely custom-built 3- to 5-bedroom single-family homes are direct lakefront. Newport Shores: Located on Waterfront Road off Center Harbor Drive, this neighborhood has 30 multi-level 3- to 5-bedroom patio homes, of which 25% are direct lakefront. Newport: On Regatta Lane off the Baron Cameron end of North Village Road, this neighborhood has 30 multi-level 3- to 5-bedroom patio homes. About 20% are direct lakefront. Newport Cove: This lovely neighborhood on Newport Cove Lane off the Baron Cameron end of North Village Road has 8 multi-level 3- to 5-bedroom single-family homes, of which 60% are direct lakefront. Hemmingway: At Hemingway Court off Center Harbor Drive, this neighborhood offers a combination of 25 multi-level 3- to 5-bedroom patio homes and 50 townhomes. About 15% of the townhomes are direct lakefront. Greenwich Point: At Greenwich Point Road off Center Harbor Drive, this neighborhood has about 25 lovely multi-level 3- to 5-bedroom patio homes, of which 25% are direct lakefront. Regardless of which sub-neighborhood residents live in, you will find them all enjoying the RA tennis courts and Lake Newport pool (Reston's only Olympic-sized, 50m swimming pool). On gorgeous days, the paths will be filled with people walking over to North Point Village Shopping Center to enjoy a coffee, ice cream, or a great meal or to do their weekly grocery shopping. Lake Newport is a fantastic area for growing families or those who are ready to downsize—it has something for everyone.